José Oliva was born in Guatemala. At only seven months old, his mother immigrated to the United States. It was not until 2011, when José was 15, that he moved to Greensboro, North Carolina to reunite with her. A lot happens in 15 years of someone’s life, especially in the context of a 22-year-old. But the roots of José’s passion, and the reasons why he is driven to excel are in that transitional journey to America. Starting a life in a foreign country at 15 is not exactly ideal. There are language barriers, cultural differences, and a whole set of knowledge and skills to learn if you want to become an active citizen. Upon arrival, José did not waste time before working to adjust. He enrolled at Doris Henderson Newcomers School, a transitional English to Speakers of Other Languages (ESOL) school. This put him on a path that, coupled with hard work, earned him admittance to Guilford College. José applied for Bonner but found that they had already more than filled their available spots. Unable to afford Guilford, Bonner was vital to José’s success. He began to call the Director of Community Learning, James Shields, who ran the program. James seemed to be inspired by José’s campaign to fill his voicemail box and decided to let him into the Bonner cohort. José recalls that James Shields, “Took a chance on me when he did not have to.” Although José had a strong GPA, his struggle with the English language led to poor standardized test scores. The chance that James took on José sticks with him to this day. Jumping at an opportunity does not quite capture the approach José took to education at Guilford. 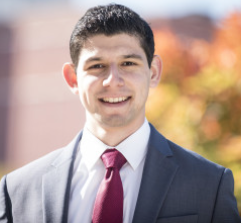 The spring of his first year attending, he won the race for Student Body President, the first Latino to do so at Guilford. He completed seven internships throughout his college career, helped to lead committees two years in a row for the city of Greensboro, served as a Fellow at the North Carolina Institute of Political Leadership, and completed over 2000 hours of service through Bonner—all while earning a place on the Dean’s List and double-majoring in Political Science and Economics. As a recent graduate, José has no intention of slowing down. He has taken a leadership role at the North Carolina Institute of Political Leadership as a volunteer faculty. He is also a member of three committees for the North Carolina Governor’s Advisory Council on Hispanic/Latino Affairs and serves as Chair of one of them. His civic and social involvement is in addition to a full-time job as a Fellow at the Z. Smith Reynolds Foundation. When José started to look for a job out of college, three things were important. The first was that he wanted a job in the South where he could have the greatest impact working on issues surrounding marginalized communities. Secondly, he wanted to have a job that allowed him to work on a variety of issues rather than pigeonhole him in once specific area. And lastly, he wanted to be in a place that he knew could provide good mentors. The Z. Smith Reynolds Foundation is an organization working on “Improving the quality of life for all North Carolinians”, according to their website. José’s job title of “Fellow” is just as broad. His days consist of working with various nonprofits and organizations to increase an array of social equity measures in the North Carolina (NC). His colleagues are exceptional professionals deeply invested in their work. In an economy where students must often beat the odds, José has found a satisfying fit. None of his days are alike, he works on a variety of issues, and is learning at a pace quick enough to meet his enthusiasm for service. Looking forward, José would like to continue serving North Carolinians and working with marginalized communities. He also wants to be a resource to young people and help them reach higher. Although he does not work primarily with youth, he has some opportunity to do so. Portions of his work are concerned with creating access to paid internships for low-income students. He is enthusiastic about mentoring and developing the next generation, a quality that he feels his coworkers share. Being able to help young people earn their chance at growth is a welcome task for someone who was in similar shoes only a few years ago.